I have just pushed SWX v2 beta live on the project's Google Code page! Along with this release the public gateway has also been updated to use SWX PHP v2 beta and allow for AS3 support. You can find documentation here, which shows how to use the new AS3 API as well as provides an introduction to the new Simple Call and Custom Call methods of interacting with your SWX gateway. Lastly, Folkert Hielema has contributed an updated Twitter service and a new Identi.ca service. Both of these services are live on the public gateway (you can test them in the Service Explorer) and also available in the SWX PHP download available on the Google Code page under "Featured Downloads". I will continue to work on updating the SWX blog with new documentation, but until then please refer to this documentation - it should provide you with everything you need to get started with v2. If you notice any issues, please log them here. For support or to discuss the new release, please use the project's mailing list. This release has been a huge effort by the SWX development team, and has been in the works since September. I'm sure you'll enjoy using it as much as we've enjoyed coding it. This looks to be a major release, and took over seven months of development. I remember speaking to Rostislav about this release back at FOTB 2008 Brighton, so he truly has put in a lot of effort. Here's hoping it gets wrapped into the expected new Gaia release. A few months back Jason McCoskery and I wrote a fairly detailed article for Flash & Flex Developers Magazine about SEO for Flash and Flex. It looks like the article has just been published in the January 2009 issue. Jason and I used our experiences in building the p.i.n.k. Spirits website as a platform for testing the concepts and they worked so well that we decided to write an article. The article covers using SWFAddress and SWFObject with PHP to provide your content in an alternate view (in this case HTML instead of Flash) for SEO purposes. The article contends that when Adobe announced they were working with Google and Yahoo! to improve the searchability of Flash and Flex websites and applications, the Flash development community largely applauded the initiative. However, months after the announcement there has been minimal increase in the effective search engine rankings of Flash and Flex websites. We discuss why the current method of Google and Yahoo! 's new 'headless player' isn't working quite yet, and how you can provide a mirror of the exact same content in your Flash and Flex projects as HTML using a single data source. This is a 'white hat' approach and doesn't break any of Google's rules. There have recently been some articles on how Google has been updating the 'headless player', namely this article on InsideRIA, and I may do a blog post updating the article if necessary. 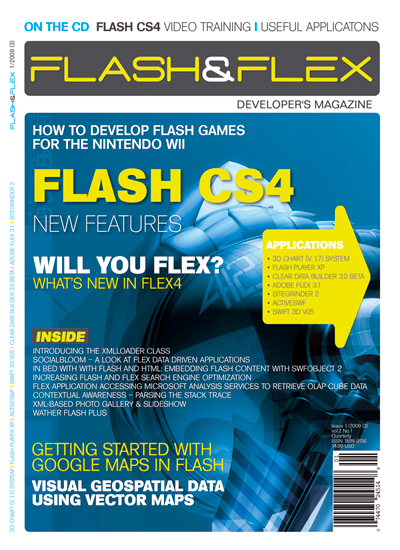 Until then, be sure to check out the article in the January 2009 issue of Flash & Flex Developers Magazine. Big Spaceship released a nice AIR app today which allows you to download and view the entire AS3 language reference locally. However, you don't need an AIR app to view the language reference offline -- there are actually two other options. I had previously posted about the offline help and language reference locations in Flash CS4 which allows you to access the local copy of the language reference from within a web browser. But did you know that you could also access these local files from within the Flash CS4 help panel? Normally when you access the help panel in Flash CS4 it automatically tries to load the online version of the documentation and language reference. I assume Adobe chose to do this so they could keep it updated and you could benefit from other user's comments in the Live Docs. Go to Window > Extensions > Connections. 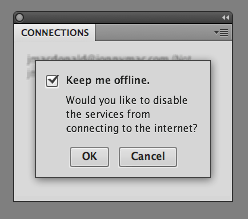 In the panel that pops up, click the arrow at the top-right and select “Offline options”. From there you can check the box for “Keep me offline”. Flash will then always default to using the offline help. I should note that doing this may also prevent you from using any other panels which call out to the internet, such as Kuler and the Flash startup/new file screen. As of now I'm not using any Internet-connected panels and I have the splash screen set to not show on startup, so this works quite well for me.